VeryPDF Acrobat to Office converts PDF documents into editable Microsoft Word (.doc or .rtf) and .txt formats, retaining original text layout and images. This conversion utility identifies tables, paragraphs, columns etc. and replicates the PDF documents to fully formatted Microsoft Word documents proficiently. Acrobat to Office Converter instantly converts PDF files into Microsoft Word documents that look just like the original - complete with all formatting and images! Information is set free - free to be edited and free to be integrated into your documents. Acrobat to Office software is a standalone program and does not require Microsoft Word, Adobe Acrobat, or even Acrobat Reader. Acrobat to Office is a batch PDF Converter that you can convert a lot of PDF files to word documents once time! saving your time! Acrobat to Office is a standalone software, MS Word, Adobe Acrobat and Reader NOT required! You can convert the whole PDF file at once or you can choose specific pages to be converted. So if you have big documents and you need to convert just part of those, Acrobat to Office Converter provides the suitable option to do so. Very often, you need to edit your PDF documents. VeryPDF Acrobat to Office allows you to be in charge of your document. Editing your converted document is absolutely easy. This document converter also converts your document to .rtf format besides .doc format. Convert multiple PDF files to any available format in a batch. 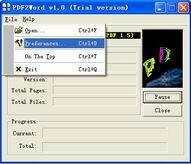 VeryPDF PDF to Word is not dependent on any other software including Microsoft Word, Adobe Acrobat, or Acrobat Reader. It is a standalone program. Acrobat to Office Converter is able to handle rotated pages, text, images, and shapes, the new software automatically recognizes rotated pages and its contents and preserves text, layout, and images in the converted Word document as in the original PDF document. If your text, image, or shape is vertical in the PDF document, it will get replicated as it is in your converted Word document. This feature is specifically beneficial for document with graphs and charts etc. Earlier version used to optimize the file size of the converted document to minimum. Now it can optimize the file size further and hence the converted document is of significantly low file size. Due to this, you can be easily upload or download your converted documents quickly.